How are weather forecasts made? Twice each day, radiosondes (weather balloons) are launched all over the world at approximately the same time. They ascend up through the troposphere (the lowest 7-10 miles of the atmosphere, where our weather occurs), and measure temperature, wind, air pressure, and wind speed and direction. This information is transmitted to the ground station, processed, then sent to the National Centers for Environmental Prediction (NCEP) in Washington, D.C. These measurements constitute a global "snapshot" of our weather at one point in time, every twelve hours. In addition to radiosondes, surface weather measurements are made at observing stations around the world (there is probably one near you), from ships and buoys at sea, from commercial aircraft, and by weather radars. All of these measurements are transmitted to different numerical weather prediction centers located in the U.S., Canada, England, Germany, Australia, and other countries. These modeling centers have very fast supercomputers that have been programmed with equations that describe how the atmosphere changes at every point in a 3D grid of points. The future change with time is computed at each gridpoint for temperature, wind (both horizontal and vertical), water vapor, cloud water, and precipitation formation. The models must also include the effects on temperature of the absorption and reflection of solar radiation, and the absorption and emission of infrared (heat) radiation. Together, all of these equations run as a computer program are called a "numerical weather forecast model". While the computer models forecast how the atmosphere evolves throughout the entire 3D volume of atmosphere, what people are most interested in is how these atmospheric changes affect the weather we experience at the surface. But until very recently, none of the models were good enough to handle the complex variety of processes happening right at the Earth's surface. In early years, human forecasters made this interpretation based upon their personal experience. Forecasting was as much an art as it was a science. Today, the primary way in which the computer model forecasts are translated in terms of surface weather elements has been through Model Output Statistics (MOS) equations. These are statistical relationships between years of previous model forecasts and the actual weather that was observed at the surface. 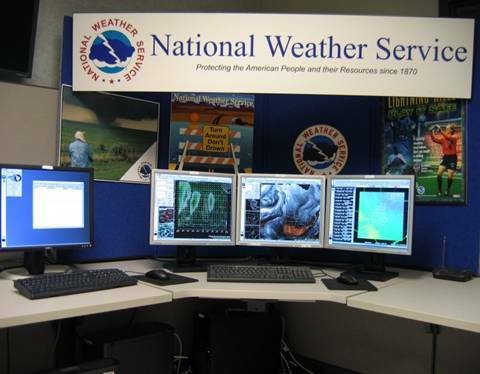 The human forecaster examines both the computer model output and the MOS predictions after every run of the forecast model (usually on a 12-hourly schedule, as new observations become available) to get a better idea of the kinds of surface weather that can be expected. As the forecast range is extended in the future from 1 day to many days, weather forecasts become progressively less skillful. The generally accepted limit for any useful level of skill is 10 days. The reason why a limit exists was accidentally discovered by Ed Lorenz in 1961, one of the pioneers of chaos theory, as he was experimenting with one of the earliest computer weather forecast models. He found that the model produced a totally different forecast if the model was stopped, then restarted, part way through its computer run, compared to if the model was allowed to complete its run without stopping. This happened because when the computer run was stopped, its forecast at that point was stored as numbers that had a level of precision less than the level of precision the computer used. The extremely small difference in numbers resulting when the model was restarted was, in effect, a slightly different set of weather conditions. As the model progressed many days into the future, those small differences were amplified into totally different weather patterns. This demonstrated the rather fascinating fact that everything that happens, even in your backyard, eventually impacts the future state of global weather patterns. While this might sound like your backyard is 'important' to global weather, its importance is diluted by the near-infinite number of backyard-size spots of land and ocean covering the entire Earth.